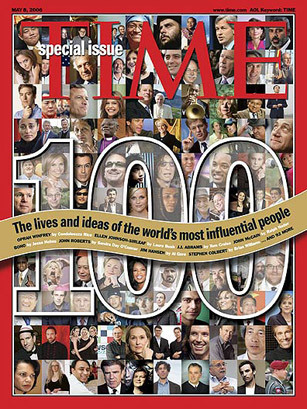 How do you juggle 100 different writers, most of them famous people like Laura Bush, Sandra Day O'Connor, Tom Cruise and the others pictured on this page, each writing a profile of one of the 100 people that TIME has deemed the most influential people on the planet? If you're Adi Ignatius, you do it with verve, patience and imagination. It surely helps that this is the second year in which Adi, along with Marti Golon and Jay Colton, has overseen our TIME 100 project, and I'm pleased to say that I think this is our most intriguing list yet. It is also our largest issue since we named Albert Einstein our Person of the Century six years ago, an appropriate milestone since this week's double issue has its roots in our series naming the 100 most influential people of the 20th century. The TIME 100 is now a much anticipated annual issue, in its third year, and since we view anyone who makes the list as being a permanent member of the TIME 100, we have very few repeats each year. The President is one, as is Katie Couric. Bill Clinton is back, this time paired with George H.W. Bush; Bill Gates is back too, this time with wife Melinda. One person who makes a return visit this year is the Secretary of State, who also wrote about Oprah Winfrey, which Elaine Shannon asked her to do while accompanying Rice on a trip to Baghdad. Al Gore, like Rice, is both an honoree and a contributor; as a writer, he profiled Jim Hansen, the NASA scientist who helped sound the alarm on climate change. Tom Cruise, who wrote about J.J. Abrams, was the first contributor to turn in his copy to Belinda Luscombe, quite a feat given what else is going on his life. (As a writer, by the way, he is fond of italics.) Charles Barkley proved eager to write about the sensational Steve Nash, but as Sean Gregory discovered, Barkley's promise to call in the "late afternoon" turned into 11:30 p.m. Inspired by Tom Brokaw's writing about Jon Stewart last year, Adi asked Brian Williams to tackle Stephen Colbert. Adi caught Williams on his way to New Orleans, and after some gentle ribbing about the deadline, Williams turned in a piece that deftly captured Colbert's brilliant delivery. We have two fold-out sections this year, "Power Couples" and another called "Six Degrees of Separation," in which Clayton Neuman and D.W. Pine track the amazing TIME 100 connections shared by Bill Clinton, Oprah Winfrey, Bono and Steve Jobs. The chart is meant to bring a smile, but it also underscores what the TIME 100 list shows: we live in an interconnected and global village, a place where people you might not have heard about, as well as those you have, are influencing the way we live in the 21st century.